ARF3, also known as ADP-ribosylation factor 3, functions as an allosteric activator of the cholera toxin catalytic subunit, an ADP-ribosyltransferase. This protein involved in protein trafficking; may modulate vesicle budding and uncoating within the Golgi apparatus. 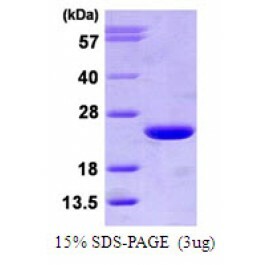 Recombinant human ARF3 protein, fused to His-tag at N-terminus, was expressed in E.coli and purified by using conventional chromatography.